Nahan, an offbeat town of Himachal Pradesh, is quietly located on a hilltop of the mighty Shivalik range. The town is said to have been established by Raja Karam Prakash back in 1621. There are a couple of legends associated with the name of the town. One of them says that Nahar in Sanskrit means "lion" and due to the presence of a number of lions, the town was named after it. The other legend says that once upon a time, the king of the town was hunting and when he was just about to kill a tiger, he was asked not to do so (Nahar also means "don't kill") by a Saint. This quaint town is located at a distance of just 250 km from Delhi and 78 km from Chandigarh, making it an ideal destination for a quick romantic getaway. Read about the places to visit on the way and in the beautiful town of Nahan. Read about places you can visit on the way and in Nahan. Recall the name from the many battles you have read about in your history textbooks? You've recalled it right. This historic town was precisely where the three Battles of Panipat, during the Mughal era, took place. The town is located just 85 km from Delhi. You can witness the tomb of Ibrahim Lodhi, the Sultan who was part of the first battle of Panipat, the statue of Hemchandra Vikramaditya, who was part of the second battle of Panipat and other intriguing places like the Panipat Museum, Kabuli Bagh Mosque, etc. These towns are popular due to mythological significance they hold. While Karnal is believed to be founded by Karna, the character from the Hindu epic Mahabharata, Kurukshetra is the battlefield of the epic and the place where Bhagavad Gita was made. These towns are located at a distance of 117 km and 155 km from Delhi respectively. Some of the places you can visit here include Karna Lake, Sthaneshwar Mahadev Temple, Brahma Sarovar, to name a few. 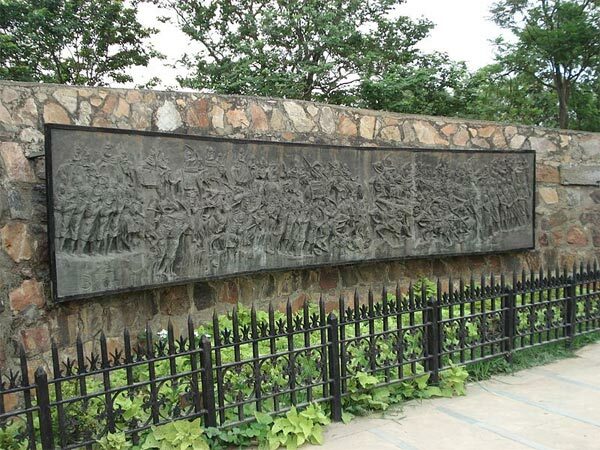 The Shivalik Fossil Park falls under the National Geo-heritage monument, since it is a park that consists of prehistoric skeletons, geological formations of clay, sandstone and more, at Suketi. Which is why it is also known as Suketi Fossil Park. The park has fibreglass models of 6 extinct animals that include giant turtles, large tusked elephants of Shivalik hills, four-horned giraffe, etc. It also happens to be Asia's biggest fossil park. A few kilometres from the town, lies the beautiful Renuka Lake which happens to be the largest lake in Himachal Pradesh. Named after the Goddess Renuka, a five-day-long fair takes place near the lake in honour of the goddess. A sanctuary is situated in the nearby forest, where a lion safari is available. The mesmerising Jaitak Fort is perched at a brilliant altitude of 4850 ft and is located about 15 kilometres from the town. The fort was built on the ruins of Nahan Fort by a Gurkha leader named Ranjor Singh Thapa in 1810. It is built in a strategic location that offers a stunning panoramic view of the town.